August 26, 2017 at 12:07a.m. Township officials have plans for another project on the Market Street property where a new fire station is being built. The township hopes to corral community support to build a memorial honoring safety-service workers. The memorial also will pay tribute to the police officers and firefighters who died as a result of the Sept. 11, 2001, terrorist attacks. Pitzer noted that Sept. 11, 2001, was a “very, very significant” day for safety-service workers, with hundreds of firefighters and paramedics and dozens of police officers killed. Township officials will unveil plans for the memorial Sept. 11, when township trustees will meet and the annual Battle of the Badges softball game between township police officers and firefighters will take place. Those planning the memorial envision a reflecting pool (in the shape of a pentagon, a nod to the Sept. 11 attack at the Pentagon), behind which will stand two sloping walls – one to honor police, the other to honor firefighters. Images of police officers and firefighters holding up flags will be laser cut onto the walls. Pitzer said that in the event that any township police officer or firefighter were to die in the line of duty, their name would be etched on to the wall. Between the two walls will be two 8-foot-tall towers (in honor of the attacks on the World Trade Center’s twin towers), one projecting red lighting and the other projecting blue lighting. Behind the walls will be flags. Opposite the walls will be several benches and landscaping features. Pitzer said he envisions the memorial as having a “somber” feel. Over the next several months, officials plan to reach out to community members, police, fire and trade union members, and others to contribute to the project. 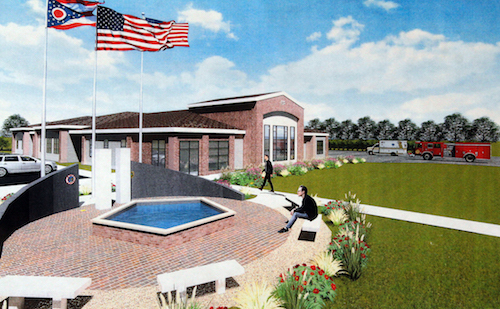 Officials hope to build it while construction on the fire station is taking place. The fire station is slated to be complete early next year. The memorial will be located in front of the fire station, which is being constructed at the corner of Market and Stadium Drive. “You won’t be able to miss it,” Pitzer said. August 25, 2017 10:55 p.m.
March 31, 2017 12:05 a.m.